Ranch Mart North is slated for a starkly modern redesign. 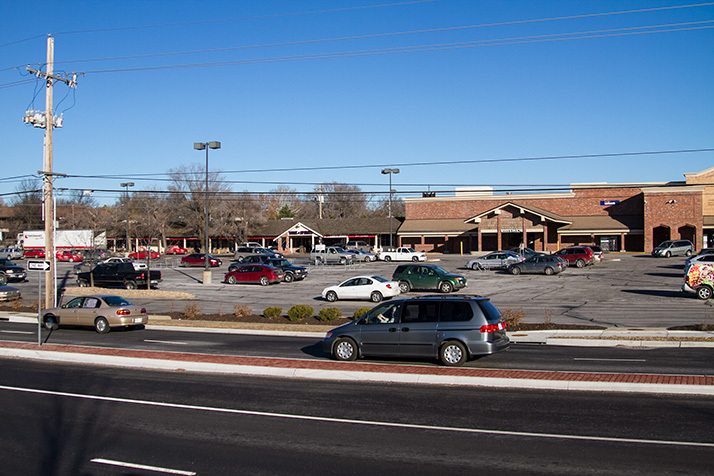 The Ranch Mart North Shopping Center appears headed for a cleaner, modern look, and although some neighbors are skeptical, the Leawood City Council gave its conditional blessing Monday night. The council approved a set of measures that will start the ball rolling to substantially change the look, if not the square footage, of the 1960s-era shopping center. The redevelopment will essentially replace the building’s main façade, add a plaza area and more parking isles, and demolish the former bowling alley on the northeast side to be replaced by a two-story office and retail building. A rendering of the redesigned shopping center looking to the north. Three existing pad sites, including McDonald’s, a bank and the CareNow, the former post office, would remain. Council members voted their unanimous support for the preliminary plan plus rezoning and special use permits. But Councilmember Lisa Harrison said she’s heard from some neighbors who are not completely enthusiastic about the modern new look. “Was there ever any other consideration for a more traditional looking façade, less Crate and Barrel, less Apple, a little bit more traditional?” she said. The architects and developer decided to go with a “bold step” in the redo of the shopping center at 95th Street and Mission Road, said Chris Hafner of Davidson Architecture and Engineering. The Leawood Planning Commission unanimously recommended approval for the redesign at its meeting in October. With the council’s approval Monday, the developer is set to move forward on detailed planning work and financing. Owner Bob Regnier undertook the redevelopment of Ranch Mart South about a decade ago, with the first phase of that project entirely privately funded. Overland Park approved a community improvement district sales tax for the Ranch Mart South properties in 2014, though. It appears likely that the owner may seek public finance incentives for the Ranch Mart North project ahead of any work being done. An overhead view of the design concept approved by the Leawood council Monday. Council members were generally supportive of the concept, but suggested the developer keep working with the planning commission on a few details on the screening of trash and street and circulation of traffic around the McDonald’s drive-thru, for instance. Harrison also asked the developer to take another look at plans to add a drive-thru pharmacy to the Price Chopper. Adding the pharmacy would eliminate the grocery drive-up, which would be missed by older customers, she said. The store would have some parking dedicated to pickup from on-line shoppers, however. Despite the concerns, council members praised the development team for the plan. “With the neighborhood I think the day or reckoning has come and after years and years and years of promises and everything I think the neighborhood is very excited to have this project go forward,” said Councilmember Andrew Osman. The Ranch Mart center is an iconic part of childhood for many in Leawood, said attorney Curtis Petersen, representing Ranch Mart North LLC. “This is a place that’s really special for a lot of us who have grown up here and I know that many of you know that there have been struggles for the past close to a decade to put together some sort of financial backing for a plan that’s really a rebirth of Ranch Mart,” he said. Petersen did not yet have an estimate for the cost of the development. But he told the council that a community improvement district to raise money for development costs is still being worked out and would be an “integral” part of the plan. A CID would be discussed by the council at a later date.